Salon Equipment - acrylic Nail Polish Displays. Polish Displays and racks for counters and walls. 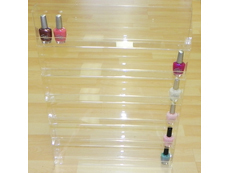 Features: This clear acrylic Nail Polish Display holds approx 12 bottles in 3 shelves. Sits on counter. Size: 14 x 12 x 11.5 cm (L*W*H). Click to buy this model now online. 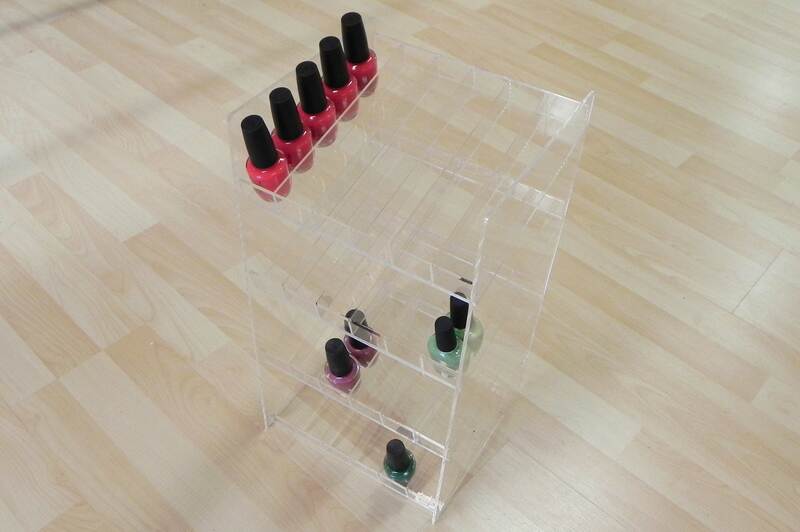 Features: This clear acrylic Nail Polish Display holds approx 24 bottles in 3 shelves. Sits on counter. Needs minor assembly. Size: 29.5 x 13.5 x 10 cm (L*W*H). Acrylic stand for Nail Polishes (#M-T3X10). 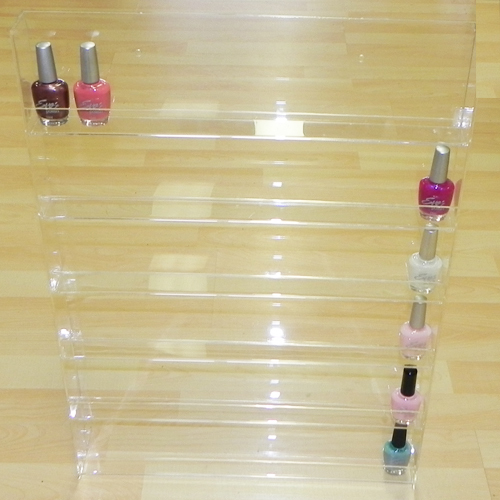 Features: This clear acrylic stand for Nail Polishes holds approx 30 bottles in 3 shelves. Needs minor assembly. Sits on counter. Size: 36.5 x 13.5 x 10 cm (L*W*H). Nail Polish acrylic stand (#M-T6X12). Features: This clear acrylic stand holds approx 72 Nail Polish bottles over 6 shelves. Sits on counter. Size: 43.5 x 25.5 x 18 cm (L*W*H). Features: This acrylic Nail Polish Display with removable black header advertising board holds approx 36 bottles in 3 shelves. Sits on counter. Size: 14.9 x 21 x 39.5 cm (L*W*H). Acrylic wall Nail Polish Display (#NTS50). Features: This acrylic Nail Polish Display holds approx 45 bottles in 5 shelves. Size: 35 x 20.5 x 19 cm (L*W*H). Click to buy this acrylic Display now online. 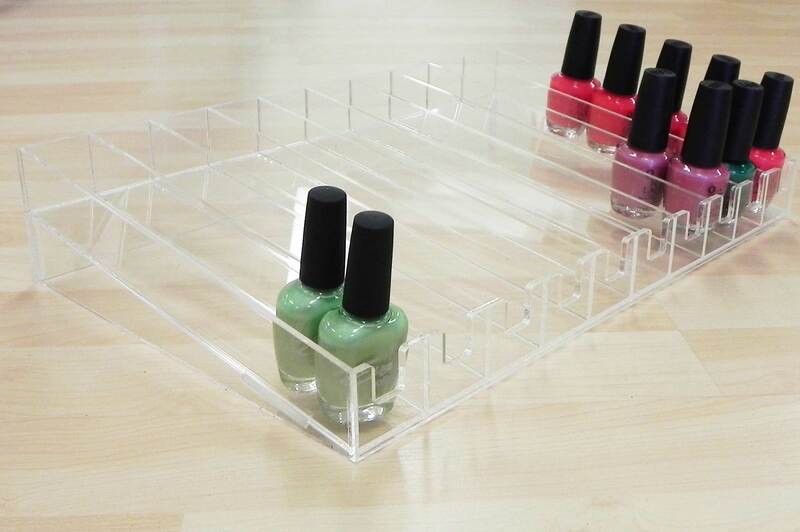 Acrylic Nail Polish Display (#DISP74). 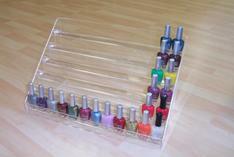 Features: This acrylic Nail Polish Display holds approx 60 bottles in 10 rows. Sits on counter. Size: 37.3 x 28 x 7 cm (L*W*H). Click to buy this acrylic model now online. 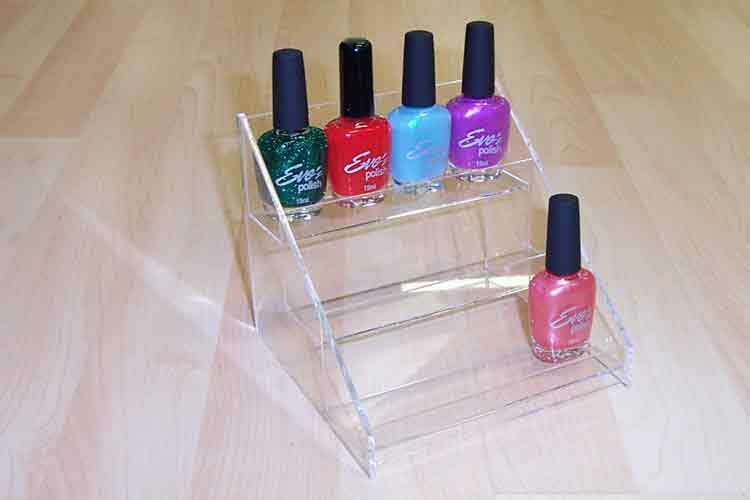 Acrylic Nail Polish stand (#1503B). Features: This acrylic Nail Polish Display holds approx 60 bottles in 6 shelves. Sits on counter. Size: 35 x 24.5 x 19 cm (L*W*H). Click to buy this acrylic unit now online. 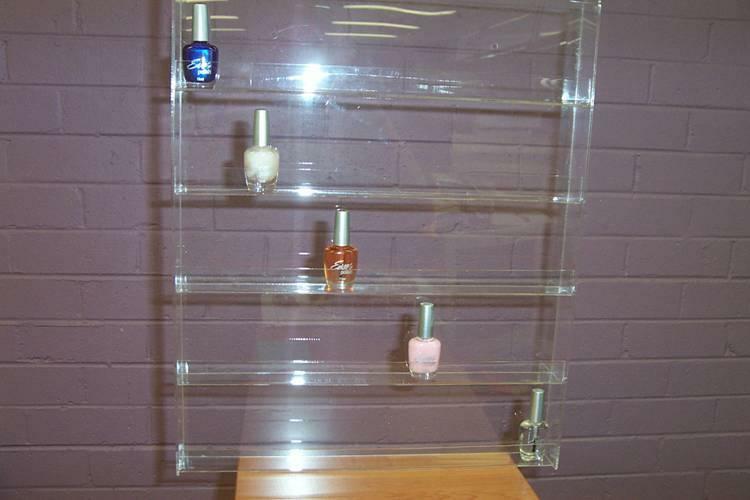 Acrylic wall Nail Polish Display (#DISP87). Features: This wall acrylic unit holds up to 56 OPI bottles over 5 shelves. 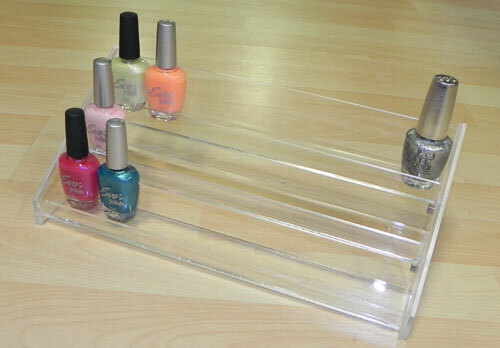 Acrylic Nail Polish stand (#DISP66). Features: This acrylic Nail Polish Display holds approx 120 bottles in 4 shelves. Sits on counter. Size: 22.2 x 21 x 42 cm (L*W*H). Click to buy this acrylic Polish holder now online. 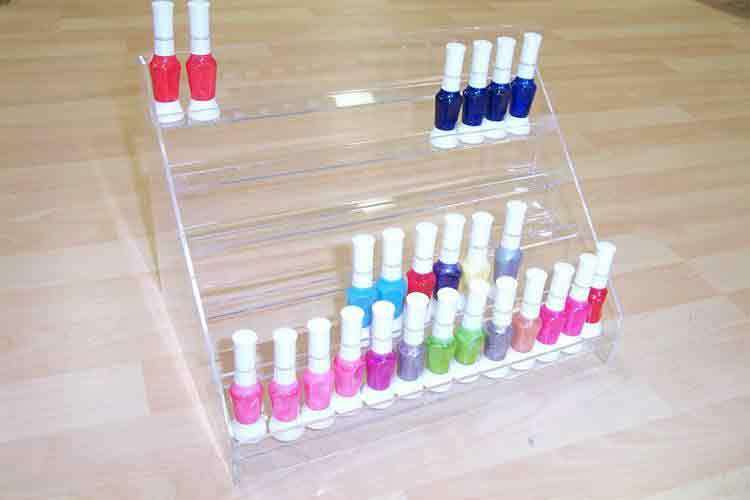 Acrylic Nail Polish Display (#1503A). Features: This acrylic Nail Polish Display holds up to 72 bottles in 6 shelves. Sits on counter. Size: 42 x 24.5 x 29 cm (L*W*H). Click to buy this acrylic stand now online. Acrylic wall Nail stand for Nail Polish Display (#1503W). Features: This wall mountable Nail Polish Display holds approx 72 bottles in 6 shelves. This stand does not fit OPI Nail Polish bottles. Size: 41.5 x 4.5 x 60 cm (L*W*H). Click to buy this acrylic wall stand now online. Acrylic wall Nail Polish Display (#NWS90). Features: This wall mountable Nail Polish Display holds approx 84 bottles in 6 shelves. Size: 50.5 x 4.7 x 60 cm (L*W*H).